Ya Jagoff!!! | A Lotta-Carmel-Crappa-Macchiato "Peter Parker"
The pic above of the Lotta-Carmel-Crappa-Macchiato “Peter Parker” was sent to us. And being familiar with where this photo was taken, we HAD to make this an immediate post. I frequently visit the Starbucks on Greentree Road. More than once, this “gentleman” has come in the store while I’m there, and ALWAYS parks in the fire lane. Right in front of a sign that reads “no parking fire lane” and on top of the yellow lines that also read “no parking”. 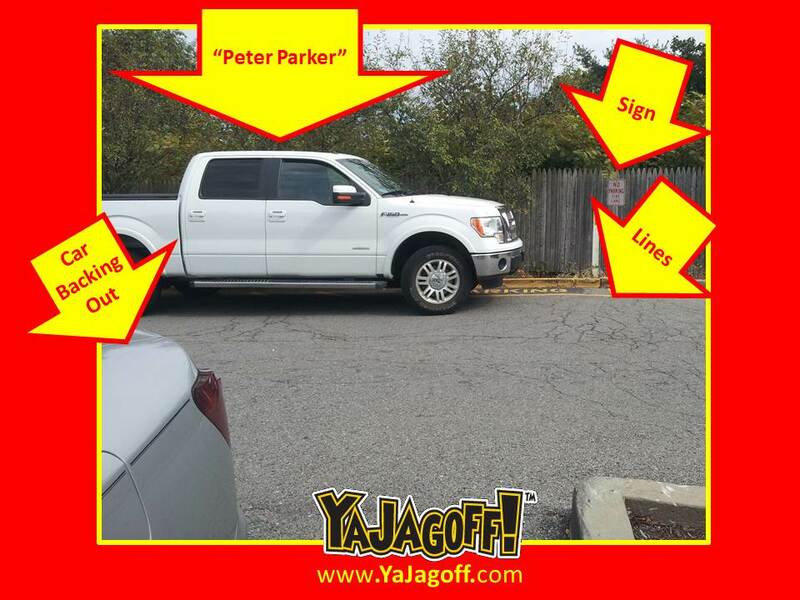 Now, I can sympathize with the fact that this particular Starbucks location has a tiny parking lot, but I’ve seen him park his big-a$$ F150 in that exact spot even when there are open spaces. The best part it, he doesn’t seem to care that he’s blocking other people (in this case me and two others) from being able to back out of our parking spots. You know how people refer to things being the size of a Postage Stamp? Well this parking lot actually IS. The parking lot, on a weekday morning, looks like the Kennywood Bumper Cars with a bunch of 5-year olds driving. Many of the drivers pull thru the drive-thru and then stop, right in the middle of the postage stamp sized lot, to put their money away, comb their hair, fix their make-up and adjust their cardboard coffee holder while others are trying to park. Then comes THIS guy who keeps parking his big ol’ truck in the fire lane, blocking the lane AND causing, what we call, a Cluster Truck situation. Probably because he has no idea how to back up a truck that size. Hey “Larry-Lotta-Carmel-Crappa-Macchiato,” at the risk of over-stereotyping you, and appearing extremely shallow, we ask: shouldn’t a guy with a truck like that have a thermos full of some battery-acid-type coffee and be thumbing his nose at Starbuck-ians? And did you know that we’ve heard that the size of a man’s truck is inversely proportional to the size of his………………………………………………………………(wait for it)……………………………………………………… Carmel Macchiato? But getting back to more shallow stereotyping, shouldn’t you have a landscaping trailer attached to that truck and be at the local Sheetz, during the height of morning rush hour, simultaneously blocking 9 gas pumps while you fill 37 1-gallon gas cans then run in and get a 48-cent jug-O-coffee? Keep parking like that and we are going to form a group to sit in the Greentree Starbucks and wait for you to park like that. And when you do, we are all going to sip on our coffee’s and, from a distance, use our pointing finger and thumb to pretend we’re squishing your head (like we did in 3rd grade) causing you UNREAL headache pain, Ya Jagoff?? THANKS TO TWITTER FOLLOWER Charlee Monroe for being our Honorary Jagoff Catcher today. 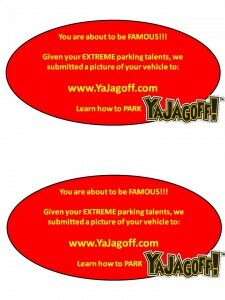 Suggestion… click the pic below to print of your very own Ya Jagoff Parking Tags. Previous articleHey!! Do You Have A Listening Problem?? Next articleWhat the #$% ?